PrologueTwelve miles west of Boston lies its wealthiest, and seemingly healthiest, suburb. Along its winding, wooded roads, one can find a private tennis club, two golf clubs (including the 115-year-old Weston Golf Club and the nationally known Pine Brook Country Club), 13 soccer fields, and 19 baseball diamonds — and not a single fast-food restaurant. Established in 1713, the town has the highest median household income in Massachusetts, as well as the state’s best public school system, according to Boston magazine. Its recreation department offers nearly 500 classes a year in yoga, karate, gymnastics, swimming, fencing, basketball, Pilates — even tap dancing. David Ortiz and Kevin Youkilis of the Boston Red Sox live there. Ray Allen of the Celtics lives just over the town line. The scent of overripe apples fills the air in the autumn, when tourists drive past the town’s old stone walls and buy pumpkins from its roadside stands. Storybook beautiful, Weston is the kind of place where parents dream of raising their children.So it took 41-year-old Rikki Conley by surprise when, early on the morning of September 17, 2007, she heard that another child in town might have the same rare, incurable, life-threatening illness that both of her young daughters, Ashley and Kelley, had been battling for years: type 1 diabetes mellitus — formerly known as “childhood onset,” “insulin-dependent,” or ” juvenile” diabetes. No other children in the elementary school that Kelley and Ashley attended had diabetes; the school nurse there had never before treated the disease, and had to learn everything from scratch. In fact, Rikki had to drive to other towns to attend coffees for parents of diabetic children hosted by the Juvenile Diabetes Research Foundation. So the idea that Kelley’s best friend’s brother, Gus, could now have it too — especially since the two families were so friendly, having occasionally gotten together for dinner or swimming — struck Rikki as simply impossible. And the pretty blue-eyed mom with honey-blond hair had as good a grasp of such things as any non-expert; after all, her husband, Kevin, was chairman of the board of the Joslin Diabetes Center, perhaps the most famous diabetes treatment and research institution in the world. “I’ll come right over and do a blood-sugar test,” Rikki said calmly, now convinced that Ann Marie’s suspicions weren’t so groundless. Rikki pricked his finger with a spring-triggered device and squeezed it for a drop of blood. She blotted it onto the end of an inchlong plastic strip protruding from the hand-held device that was the size of a cell phone. After what seemed like three years to Ann Marie, Gus’s number flashed on the device’s screen. Normal would be under 120. Gus’s number was 292. During the two-day span of Gus’s hospitalization at Children’s Hospital, the Boston institution affiliated with Joslin, Rikki remembered something: another child in town had been diagnosed with type 1 diabetes back in April. Six-year-old Grayson Welo was just one year younger than Gus. She attended a private school, so neither Rikki’s nor Ann Marie’s children knew her. But she lived right around the corner from Gus, just a two-minute walk away. How weird is that? Rikki thought. Less than two months later, things got weirder. On November 6, another little girl, Natalia Gormley, was also diagnosed with the supposedly rare disease on her tenth birthday. She lived just a few blocks from Rikki. A school nurse asked Ann Marie to let her know if any other new cases were diagnosed. They didn’t have long to wait. In the third week of January 2008, Rikki’s daughter Kelley heard from a friend at the stables where she went horseback riding that another kid, 12-year-old Sean Richard, was diagnosed with diabetes on January 16. He lived less than a mile from Ann Marie, in a house that faced her street. That made four cases in nine months. Six weeks later, eight-year-old Finn Sullivan became the fifth case of type 1 diabetes diagnosed in Weston in less than a year. He lived on Ann Marie’s block, just six doors down. They put her in touch with Suzanne K. Condon, associate commissioner and director of Environmental Health at the Massachusetts Department of Public Health. Condon remembered Ann Marie from when she worked there and assured her that she would have her staff look into the matter. In fact, she told Ann Marie, Massachusetts had recently become one of the only states in the country funded by the Centers for Disease Control and Prevention to establish an Environmental Health Tracking System. Although the program was initially examining local rates of childhood asthma, it could just as well track type 1 diabetes in children on a town-by-town level. She promised to begin doing just that. In the meanwhile, according to the best estimates from the CDC, for every 100,000 children in a given area, about 19 new cases should be diagnosed each year. With about 3,200 residents under the age of 18 living in Weston, the CDC statistics would mean that fewer than one child per year should be diagnosed with the disease. Two months later, on April 28, six-year-old Mya Smith became the sixth case diagnosed in 12 months. Although she lived just over the town line, in neighboring Bryn Mawr, Mya and her family lived within two miles of all the other cases. Then, on Sunday, June 15, came the jaw-dropper, when 17-month-old Walker Allen was diagnosed. Two nights later, his father, Ray Allen, scored 26 points in game six of the NBA playoffs to give the Celtics their first championship in 22 years. Not knowing where the Allens lived, Rikki joked sarcastically to a friend, “He probably lives in our neighborhood.” In fact, he did — less than half a mile from Ann Marie. This brought to seven the number of children diagnosed with type 1 diabetes in the past 14 months, all living within the same two-mile radius. 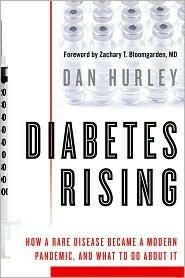 Excerpted from Diabetes Rising: How a Rare Disease Became a Modern Pandemic, and What to Do About It by Dan Hurley by permission of Kaplan Publishing.